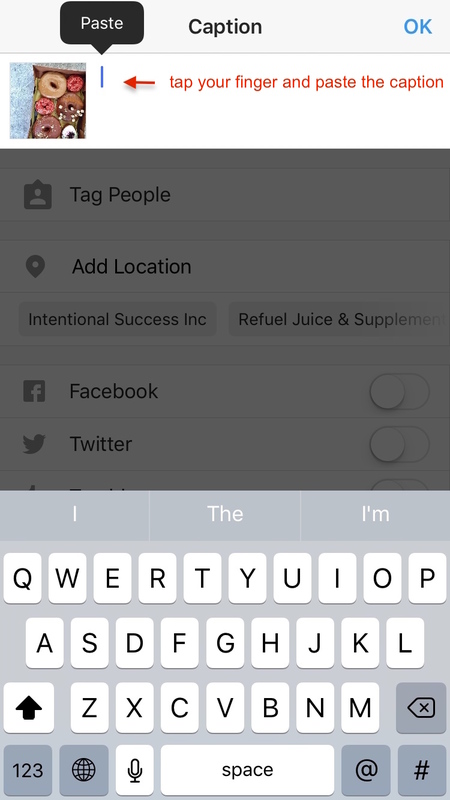 Notification Posts: Later automatically copies your caption to your clipboard when publishing, simply tap on the caption field to paste it in. Auto Publish Posts: your caption will be automatically published for you. If you've already enabled auto publishing to Instagram from Later, your captions will be automatically added once the post goes live on Instagram! Line breaks and formats are often stripped off by Instagram when auto publishing, to ensure they are retained schedule auto publish posts from Later on the web. Plus you can also do some last edits to your post and add tags, locations and filters! Open the mobile notification we send to your mobile device when it's time to post! Once you open the post from Later to Instagram, we actually copy the caption you created on desktop or mobile to your phone's clipboard. All you have to do is paste your caption in Instagram (you can do this by holding your finger on the caption area to get the paste option!). Have an IOS? Tap your finger in the caption box to paste. Have an Android? Hold your finger in the caption box to paste. Instagram no longer lets any third party app automatically carry over your captions -- they made this change due to too many apps out there ruining the fun for everyone.